The ASME approved 90° relief valves AR Series, provide precise control set points which protect cryogenic vessels and piping systems for over-pressurization. • High flow rates are approved by rigorous testing to ASME Code VIII. • The ninety degree configuration provides relief of LNG gases directly avoiding flow through the spring. • Bubble tight seat provides 100% shut off when reseating or static mode. • A variety of inlets and pressure settings assure adherence to application requirements. 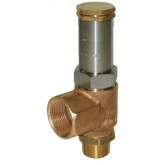 Pressure Relief Valve, Angle, ASME 1/2" x 1"
Pressure Relief Valve, Angle, ASME 3/4" x 1"
Pressure Relief Valve, Angle, ASME 1" x 1-1/4"
Pressure Relief Valve, Angle, ASME 1-1/2" x 2"